Inspiration: Rich Roll, the podcast host and ultra distance athlete, is 100% the inspiration for this smoothie. I had listened to his amazing podcast for about 7 months before I began my journey into eating this blend daily on July 4th 2015. I cannot thank him enough for what his constant mention of “Green Smoothies” on the podcast did for my mind, body and spirit. That is why I have dedicated a section of this website for his podcast. It was so fun to get to serve my smoothie to him and his wife Julie, when they came up to support me at my Spokane VegFest in 2016. You can check out my list of podcast episode recommendations here. Here is the video of the smoothie creation processs. In the video I cover the ingredients, knife safety, blenders and everything you need to know to start making daily life transforming smoothies. The video showcases an older version which really targets healing the gut and is not nearly as tasty as my current version. I ate this version for about 2 years before I realized I need to tweak it to make it more palatable for my tastebuds. This involved increasing the orange, banana amounts. Whatever you do, make sure you can palate the smoothie, otherwise you will stop making them and never receive the benefits. ♦ 8 oz. Plant-Based Milk: Soy, Coconut, Cashew. ♦ 1tbsp Chia Seeds or Hemp Hearts (Omega 3 & Fiber) Soak in milk for 5-10 minutes before blending. What & How do I eat? Intermittent Fasting: This is a really incredible tool to help heal the digestive system/gut and in turn helps keep the waistline consistent. You can read more about how I stumbled into intermittent fasting below but it is truly remarkable. I start my Smoothie between 1-3PM each day depending on how my body feels. Somedays I get up at 6am so I am up and about for up to 7-8 hours before eating my first food for the day. I have been able to do 30+ miles on a bike ride before my smoothie and many other feats which our traditional nutritional organizations would disagree with. You can see quite a few of the amazing benefits of intermittent fasting by clicking the image. Water: This is one of the keys to health and everyone knows it but so few take advantage of it. In 2013 while on a hike one of my vegan pals talked to me about this wonder potion. Before that day I had experienced more than a decade of very painful chronic back issues. At the time of starting my water regiment I was taking an advil regiment, prescribed by my doctor, doing bi weekly massages and still barely comfortable enough to stand after a day of sitting in my office. My entire life was transformed by water. Within weeks I no longer needed the advil and shortly afterwards I made the realization that my chronic back pain was 90% from being chronically dehydrated. EVERYONE MUST DRINK A MINIMUM OF 64oz of water. I have heard so many BS reports how this is not necessary but I am living proof that it is. We have to remember that our society is designed to flourish with sick people. Corporations want to keep people sick to keep the money rolling in. 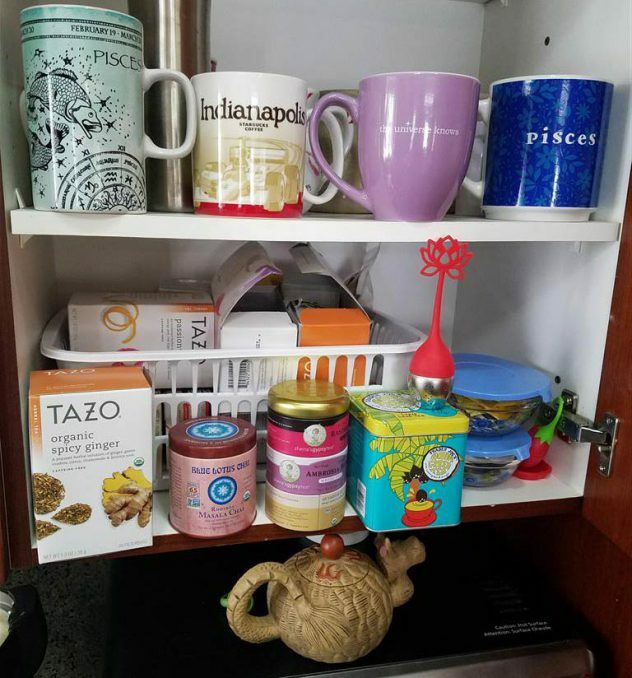 Tea: In 2016 I changed my daily water into 32oz of tea daily. Now I drink a 32oz mug of tea every morning as soon as I can. Water can get a bit boring so I started switching things up and drinking a big mug of herbal tea each morning. I am not a fan of caffeine and if one is eating well and sleeping well, one will have an abundance of energy so caffeine is completely unnecessary. Dinner: Because of how I eat I am able to have pretty much whatever my heart desires for dinner each evening. Before 2014, I would bounce between 185-205lbs depending on the time of year. Compared with the average American on the SAD diet, I was pretty average but I knew I was not healthy. I went vegetarian at 12 and lived primarily on a processed plant-based diet for over 20 years. About 2 months before the film Fed Up came out I tried an experiment which involved 2 simple adjustments in my eating schedule. After watching the film I doubled down on my efforts to curb my processed sugar intake. Here is a bit more about my eating history and how I became who I am today. Because I was brainwashed, like many others in our society, I believed that to be healthy I needed to eat a large breakfast very quickly after waking up. I would daily eat 4-5 cups(wet) oatmeal with raisins for breakfast daily since I was a child. From time to time I would eat a whole wheat waffle with homemade applesauce on top or Cheerios. For the final 2 years of my pre-smoothie eating, I was eating Bob’s Red Mill Museli with a non-dairy yogurt. Most would say I eat an incredibly healthful breakfast but I had no idea how good things could be. Simultaneously, I began moving my breakfast back a little bit of time each day. I started eating around 9am, at that time I was working my old corporate job and so I would eat at my desk when I got to work to save time. I usually woke up around 8:20am, would shower and zoom to work. At this point in my life, I was still requiring at least 8.5-9 hours of sleep. Going vegan did help a bit but I was under immense stress at home living with an alcoholic and at my corporate job. Sleep has always been my favorite healthy drug. I learned at a young age that it was incredibly important to never try to cheat sleep. It has served me very well. Around January of 2015, I began eating smoothies on the weekends. They were very simple and how most people probably start and stop when it comes to “smoothies”. I made them with about 1-2 cups of berries, plant-based milk, banana or 2 and some protein powder( I still was slightly protein obsessed, haha ). I may put a couple of leaves of greens but that was not regular yet. 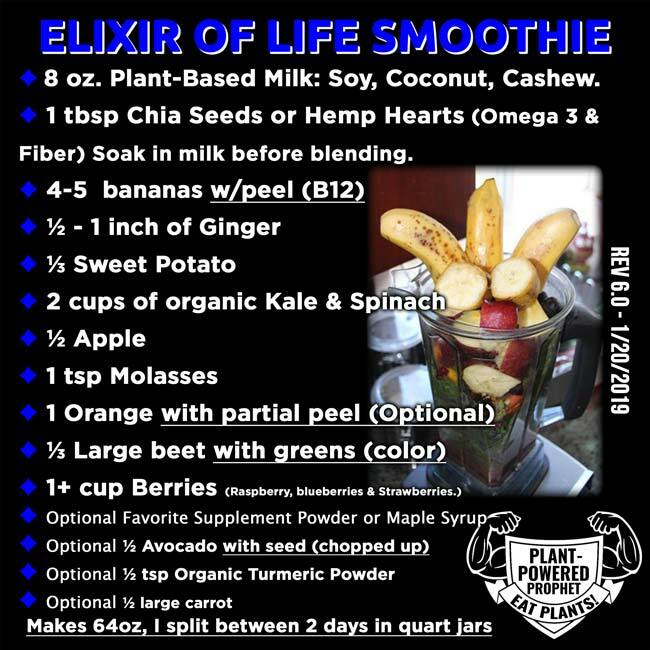 By July of 2015, I had transformed the basic simple smoothie to include many of the ingredients that I now use such as turmeric, ginger, and avocado. July 4th, 2015 was the first day that I started eating smoothies every single day. On July 5th I went through a breakup and it was not a pretty one, I guess they never are. So I decided the morning of July 6th that I would eat one of these crazy smoothies every day, to give myself enough health and nutrition to stay alive through what was going to happen next. Over the course of the next 4 months I not only went through a breakup but my ex-company began to treat me worse than ever before and then in November fired me for being vegan. I guess my intuition was right telling me that I needed before I even knew it. Over the next year of drinking my Elixir of Life smoothie, my health got even better. I required much less sleep than before( average is about 7ish now), continued to never get sick and even overcame my digestive issues relating to wheat and gluten, read more here. All in all, I stumbled upon what I believe is the fountain of youth and the best source of raw energy. I cannot imagine not eating my smoothie each day and I find it so funny that people regularly gorge themselves for breakfast and lunch and then have multiple hours where their digestive system takes over their brain so they do not have enough blood to do regular brain processing. Most do not know but when one eats a heavy meal, up to 60% of the blood in their body goes to their gut to help the processing. 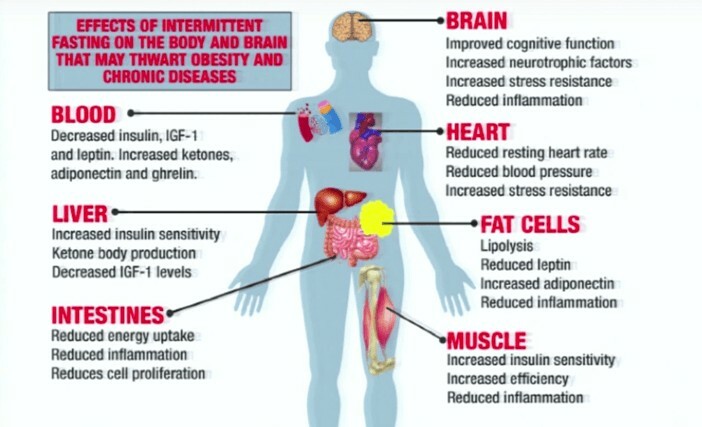 This is why it is so hard to think after a heavy fat-enriched meal. I absolutely hate the feeling when I eat a heavy meal, it makes me almost feel stupid drunk. Things that usually come very easily are much harder to do or process. What was really surprising is that after about 6 months of eating my smoothies I was able to start eating treats at night and my waistline did not expand. For over 2 years I regularly have whatever I want for dinner and after and I have stayed between 172-176lbs. I feel like I have found the magic bullet. I do enjoy treats late at night, ice cream, cookies, and other yummy foods before bed. That being said, I have to truly follow my regiment or else this does not work. I do my best to never overeat. With the snacks( 300-500 calories), Dinner(500-800 calories), and my smoothie(900-100calories) I am eating still a very sensible diet. What I have found is that have no cravings for junk food until after dinner. Part of this was my teaching myself not to eat junk until after dinner. It does take restraint but the benefits of my way of eating are pretty incredible. I DO NOT RECOMMEND ANYONE TO INCORPORATE JUNK FOOD BACK IN THEIR DIET UNTIL THEY HAVE MET THEIR IDEAL WEIGHT GOALS AND STAYED THERE FOR A MINIMUM OF 6 MONTHS. I cannot stress this enough. You have to reteach yourself how to eat sensibility or else this program will not probably work. I had a fair amount of fat on my body so I never was hungry at night, once I did lose that weight my body began to crave a bit more calories, at least that is how I think it works. Also, do not eat highly processed crap. Make your own cookies and snacks instead of store bought crap. Your body will thank you and be able to bypass the junk without holding on to it because you have healed your gut. For about 6 months, since I started working out again, I was toying with the idea of cutting out sweets again. This was primarily because I would love to see a full 6-pack on my body and I have a hypothesis that my sugar intake at night is keeping that layer of fat on my stomach. So when my girlfriend of the time got sick, a week before Valentine’s day, and I had Central Coast VegFest to put on in less than 10 days I knew I had to be extra careful to not get her flu/cold. I have stayed well for the years since going vegan and I do that by following some strict self-support steps when near people who are sick, you can read my recommendations here. One of the most important of my steps is NO SUGAR! So the first about 7-10 days were tough and I had some cravings but because I was not doing this for myself but because I did not want to let down a community of people who were depending on me for the event, I stuck with it. I honestly do not know if I would have gone through if it was not for that event. In the end, I was able to go through the week with her and put on the event without getting her cold. It took her out for about 10 days. So at the writing of this(March 18, 2018), I have not been actively eating sugar foods for about 7 weeks. What I have noticed is a very minor slimming on my body. That is pretty much the only change but I am happy that I no longer crave sugar in an uncontrolled manner. Just a few months ago, if it was a vegan and a sweet, it would land in my mouth 🙂 On my birthday I did eat 1.5 maple bar donuts but because the bacteria in my gut are much more healthful, my body did not go into full cravings again. I have eaten a few other sweets in the past 7 weeks but so far I have kept my addiction at bay 🙂 I also have been eating Apples on a much more regular basis than before. Josh Lajaunie got me interested in Apples, I have never really eaten them outside of my smoothie. Watching him down a 3lb bag in a single day was inspirational. 🙂 So I am eating more natural fruits outside of my smoothie.